After five days of grinding inside the plush confines of Casino Marbella, Ludovic Geilich has become the first UKIPT winner of the new season. Having merged with the Estrellas Poker Tour to create a bumper field of 763 runners, this sunniest UKIPT event to-date finally came to a close last night after Geilich managed to best Pablo Rojas heads-up. Yesterday’s finale started brightly for Geilich after gratefully accepted Fernando Curto’s short stack. Having made an aggressive four-bet with pocket sixes, Curto soon found himself heading for the rail after Geilich made the call with pocket aces. After the first player out, Rojas was able to bolster his stack after Jorge Eguras’s mistimed bluff saw him hit the rail in seventh place. With eliminations now occurring at a healthy pace, Jonatan Soderstrom, Lucas Blanco and Asier Crespo all hit the rail in succession. Now poised on three players the financial negotiations began to take place and, after crunching the numbers and deliberating their cut, a deal was finally reached leaving Kamil Hrabia with 95,000, Rojas with 98,000 and Geilich with 116,000. That split left 14,000 to play for and after once Hrabia had exited stage left; Geilich slowly began to wear down Rojas before he clinched the final pot. After a series of pre-flop raises, all the chips went into the middle and when the cards were on their backs it was Geilich in front with pocket nines. With his Qs Jc needing some help, Rojas could only watch as the board ran out: Kc Td Tc 3s 8h and the final pot, and the UKIPT Marbella title, was pushed towards Geilich. Qualify for future UKIPT events at PokerStars. 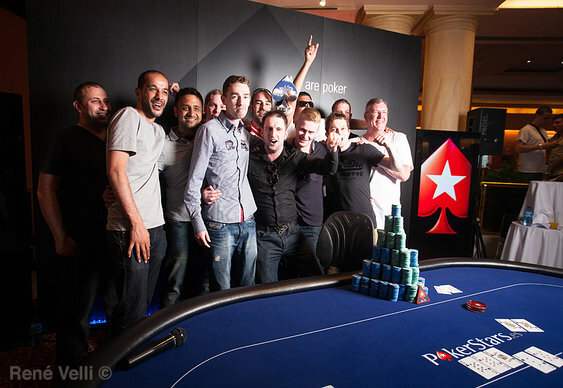 Image courtesy of Rene Velli @ PokerStars Blog.